Powers/Abilities: Agile, acrobatic, good fighter, skilled in jungle survival. He seemed to have a special rapport with a tribe of local monkeys. 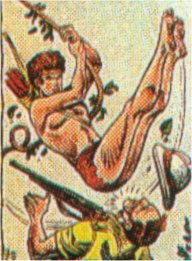 History: (Jungle Action I #1-6, ga) Unknown to his father, Jack Spears, the renowned hunter's son secretly enjoyed an adventurous life as Jungle Boy, a sort-of junior Tarzan who fought evil animals (such as the gigantic snake Serpo) and evil men (such as the Commies who tried to trick the local natives) alike. He was often accompanied on his adventures by a tribe of monkeys who aided him in his battles. 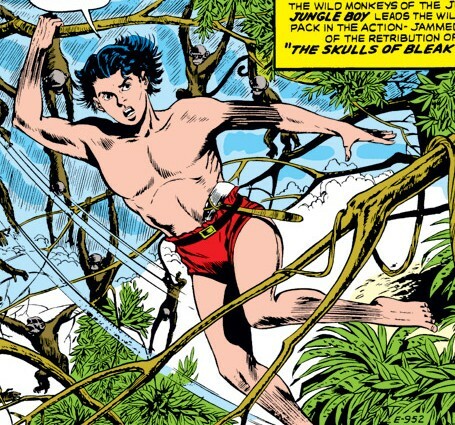 Comments: The appearance of the giant snake Serpo in one of Jungle Boy's stories suggests he inhabited the same part of Africa as both Man-Oo and Lo-Zar, who also both faced the snake.